Elaine is energetic, determined and very resourceful. Her enthusiasm is charming and you will find her to be very personable and professional. Couple this with the necessary requirements of trust, honesty and business acumen and you have a winner. Her patience and tireless work ethic have served her well with clients. There is nothing part time about Elaine and she brings an exceptional upbeat attitude and unbeatable local knowledge to the table -especially on Rowayton and area activities. Her ability to listen to clients allows her to fill their needs with care and dedication. It is with great pleasure to recommend Elaine to potentially act as your real estate broker. I have known Elaine for many years casually and find her honest, energetic, understanding and very professional. When I chose to put my house in Darien on the market, I needed special attention/handling during the process. I am a single dad raising two children while maintaining a demanding full time job. The house, although beautiful, had years of accumulated belongings that needed to be addressed in order for the house to present itself in the best light. After interviewing many brokers, I concluded that Elaine would add more to the process than just "being a broker." She would with a great sense of humor hold my hand during the process and be my guide during a somewhat emotional time, while at the same time maximize the sales price. She invested her energies in the entire process, always with a great attitude, paying attention to even the smallest details. She professional and tactfully handled the buyers, who proved to be most challenging and demanding. She provided sanity to the process, and commitment to a successful sales process. My house sold for a very good price during a difficult market and difficult time of year. She was the key to the success of the process. I highly recommend Elaine. I would like to wholeheartedly endorse Elaine Falkenberg to list your house. I have known Elaine for 10 years and she has handled numerous transactions for me, all with professionalism and a broad knowledge of the Darien and Rowayton markets. She listed my house in Darien at 3 years ago and got it sold in a tough market. When I decided it was time to buy a house a few months ago, Elaine put everything together quickly and showed me what I was looking for and I am currently in contract to purchase the house. 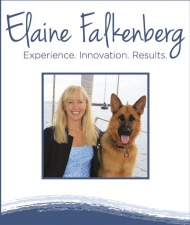 "Elaine Falkenberg combines consummate professionalism with an insider's knowledge of Rowayton and Darien. She's hard working, creative, and committed to understanding your needs. It's my pleasure to recommend her!" "Elaine Falkenberg is a class act! Her deep experience in Fairfield County real estate make her a terrific partner for anyone looking to buy or sell. Her commitment and determination were evidenced on numerous occasions as my husband & I sold our condo and found our new home. Elaine worked with us diligently every step of the way, and we would highly recommend her to anyone looking to sell or buy a home." "Elaine, you never cease to amaze us with your professionalism and thoughtfulness. We could not be happier with the house. I applaud you for encouraging us to look at this house after so much resistance on our part. I am learning that is the sign of a GREAT real estate agent. You have a hard job and it does not go unnoticed. Thank you." "Elaine has helped us sell our town home, buy our current home on Hillside, help three of our best friends buy and sell houses in town and found my mom's new home 3 years ago on the 5 Mile River in Rowayton which was amazing. Elaine has become like family to us and I would highly recommend using her if you are putting your house on the market. She really cares and will work hard to get your home sold for you." "Elaine Falkenberg sold our house in Rowayton in two weeks. We were very happy with her services. She guided us through every step of the process. We were sad to leave Rowayton but if we ever have the chance to return, Elaine will be our realtor." Elaine helped us sell our home several years ago in difficult economic conditions She did a fabulous job and was professional in every possible way yet projected a wonderful and warm personality. Have recommended to several friends. Elaine did a tremendous job of positioning and selling our home in Rowayton. She was proactive, responsive, a partner, and worked tirelessly from every angle to develop our market positioning and eventual sale of our home. In our business careers we have moved 5 times and purchase homes each time. Elaine by far stands out as the best real estate agent we have ever dealt with. She took the time to really get to know us and what our likes and needs were. She was very professional at all stages of the process, and made the process enjoyable. We have and will continue to give her as a reference to anyone that has a need for a real estate agent. Over the course of many years, I have had the pleasure of working with Elaine Falkenberg to close dozens of residential property transactions. She possesses the highest character and integrity, with a reputation well deserved as one of the most diligent, hard-working, and successful real estate agents in Darien and Rowayton. On countless occasions, Elaine's superb acumen, as well as her sheer energy, has smoothed the way to completion of contracts and closings. I had previously listed my home with Elaine back in 2008. At that time the house did not sell. At that time I was impressed with Elaine's drive to sell my home. Elaine ran several ads for my home along with numerous open houses. Elaine also brought in a home decorator to provide advise. Based on my past experience with Elaine it was any easy decision to contract with her to list my home a second time. This time was different, except Elaine sold the house with in weeks of being on the market. Elaine is extremely good at what she does, there's no question about that. She knows the Darien/Rowayton/Stamford/Norwalk markets intimately. But that's not the reason why I would recommend her. She made the process of finding a home easier by simply being a wonderful human being. I felt as though she was personally invested in our search, and I trusted her instincts from beginning to end. Four years later, I couldn't be happier with our eventual decision, and Elaine's guidance throughout. We have used Elaine twice in purchasing homes in Rowayton and her local knowledge of the real estate market is second to none (including surrounding towns). We have recommended Elaine to many friends and family and would continue to recommend her to anyone else. Not only does Elaine have extensive knowledge of the local market, the trends and the buying/selling process, but she is great at understanding people and how to motivate and engage both the buyer and the seller. Elaine provided us with great advice and guidance for how to position our house, stage it for the potential client, and she did it in a way that was knowledgeable and yet understanding of the fact that we were selling a home (to us), not just a house. She was a trusted resource and partner through the process. We have recommended Elaine to friends. This direct waterfront home with a dock in Rowayton Beach Association has it all. Grassy yard, your own beach, new seawa ..